Last night I made my way into Chef Lee’s on Columbia Road following Mayor Menino’s State of the City Address. Read it here. 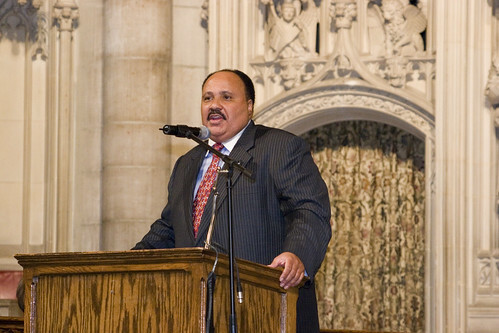 A dinner was being held to recognize Martin Luther King III who had delivered the invocation at the State of the City. King, the son of the slain civil rights leader, was in town as part of the announcement that Boston will build a statue in honor of his parents who met while the elder King was a graduate student in the city. Having covered the various speeches where Senator Obama and Senator Clinton had tangled over his father’s legacy, I approached King to get his perspective on the flap. Earlier in the day, he spoke to David Abel of The Boston Globe. “An atmosphere which has been created is a real distraction away from the real issues – employment, housing, criminal justice,” said King, standing in front of a wall adorned with photographs of his parents, Malcolm X, Thurgood Marshall and other African-American and civil rights leaders. At the same time, King blamed the press for inflaming the issue. “The press is pushing it more than anything,” King said. I also got a chance to ask King about what he thought of Obama’s speaking style, which has been likened, in part, to his father’s. But unlike King, whose father was also a well-respected Southern Baptist preacher, Obama, whose father was from Kenya and mother was from Kansas, did not grow up in that tradition. King did not make too much about how Obama has appropriated a successful, but somewhat artificial, speaking style. I would also have to praise Chef Lee, with whom I had a chance to speak when the dinner wound down. There aren’t a lot of places to get terrific fried chicken in Boston, but Chef Lee’s is one of them. I also tasted his St. Louis ribs slathered in sauce, collard greens and mac ‘n cheese. I loved his greens.